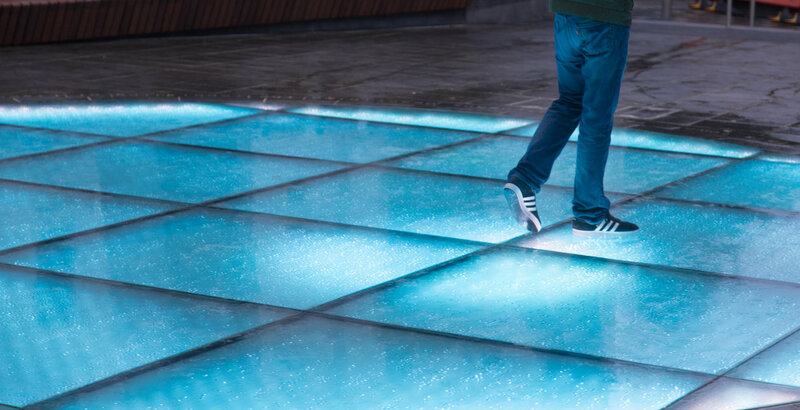 Set into the city’s central Market Square, the circular glass floor captivates spectators by producing waves of colour and light in reaction to the movement of people on and around the installation. The seven-metre diameter floor is lit from below by 4,000 individually addressable RGB LED nodes from Traxon Technologies, an OSRAM company. At scheduled times, the installation responds to movement and interaction by creating pools and waves of brilliant, saturated colour in an entrancing, ever-changing light show. Studiotech - an OSRAM partner specialising in innovative, complex LED installations - designed, installed and integrated the dancefloor. Cinimod Studio designed the interactive tracking system, which incorporates a bespoke motion sensing system, dynamic auto exposure technology and infrared illumination, to track the movement of people precisely irrespective of weather and light conditions. 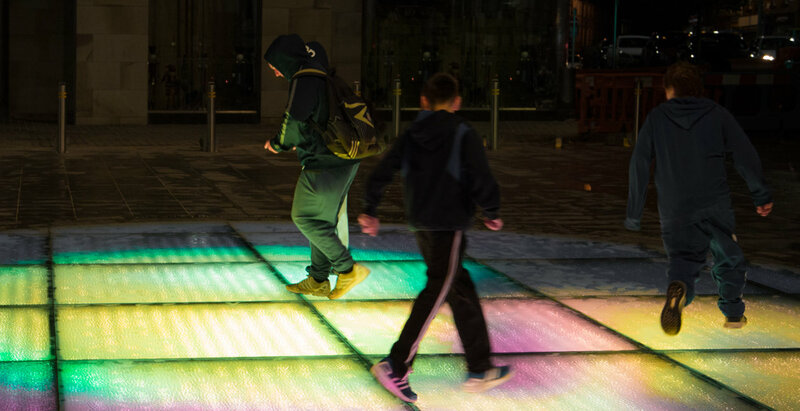 Through the motion sensing system, waves of colour form around the feet of pedestrians. The software was adapted to provide additional pre-programmed effects during the day. At the heart of the installation is a DOT XL system from Traxon Technologies, incorporating 4,000 individually addressable RGB LED nodes. The advanced, scalable, LED system transforms any surface into a brilliant palette for graphics, text and video animations in full colour. The range of LED options and accessories provide a platform for highly customised media façades, outdoor screens and structural highlights. The system is IP67-rated and UV-resistant. 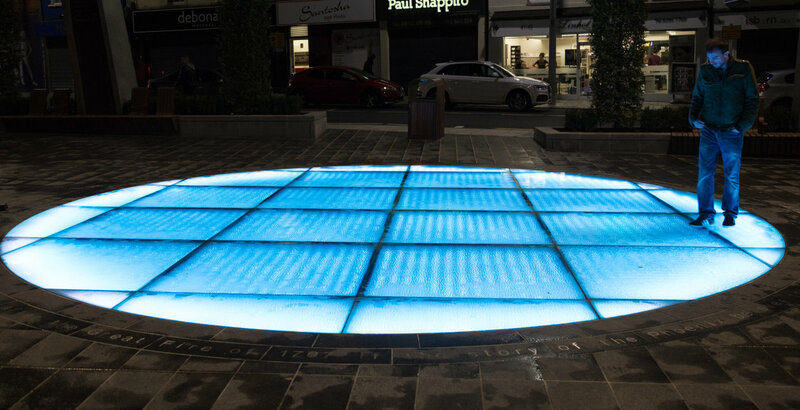 To complement the illuminated dance floor, Studiotech installed architectural lighting features in the Market Square including fully programmable RGB under-bench and rope column lighting and tree lighting. All the feature lighting is controlled by the Traxon e:cue control system and programmed using e:cue software. 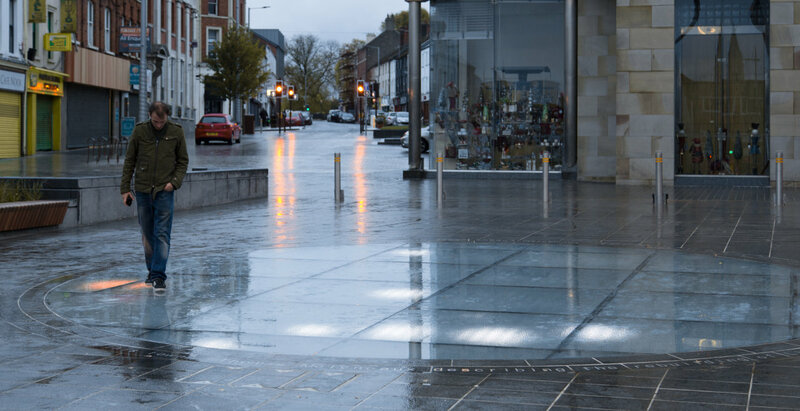 The new lighting installations are part of a £5 million regeneration project by Lisburn & Castlereagh City Council, supporting the drive to be known as the number one business destination in Northern Ireland. The project is intended to create attractive public space, increase footfall, boost retail spend and facilitate an evening economy, as well as create a compelling proposition for future investment.